Now for XP, Vista and Win7. 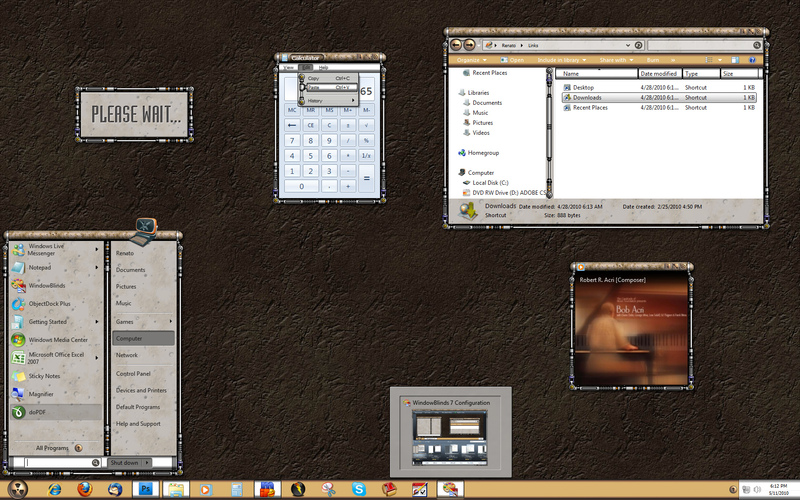 Winner of the first Windowblinds contest, this skin was originally made by Allen Bond. I just updated it including all the new goodies, wich were also used his pixels. I couldn't resit to make this, since this skin is my all times favorite ever. Please see readme file for permission. Looks great, however there is no .uis file within, so it doesn't load. Looks cool, I liked the first one too. ***UPDATED*** sorry for the inconvenience, I had problems when zipping it in the first time. Everything seams to be ok now, but please let me know if you still have any problem. Wow, nice facelift amazing detail for a WBskin. Nice to see your still workin on WBskins, always loved your work. It's great that you did this one, it's always been one of my favorites. I did updates to this and Ampulla for my own use because I wanted the scrollbars and such skinned but I was hoping Allen would come back and release his own version (and some new work). A treetog update to Capsula makes it even better! Thanks for bringing a classic into the next century! Yeah, what they said. This was an update that was long overdue. Nice going Renato. I've been waiting for the update for it ever since i've found it. I also asked Allen for it several times. It's great that you could find a minute to actually update it. Outstanding piece of artwork! Wonder if you could take care of the Ampula's too? Man, cna you make this avail for winxp. I would love to see that. A little bit Sci-Fi and a little bit "Bob's Scrapyard", well quite a lot actually! A really nice piece of graphic utilisation. Unfortunately, like most good art, it's quite hard to live with on a practical, every day basis; which could be said of most of the skins at this site. Your time hasn't been wasted. This is one of my personal favorites!! Any chance of an XP version? Would be nice if there were another update to this ... It's one of the classics. Thanks, it's my all time favorite as well.